Those of you who follow "foodie" news may be aware of the fact that cases of chefs and restaurant owners taking legal action against bloggers are on the rise. Currently this is mostly happening in other countries, but how long can it really be before it catches on here? When I first started out, there were only two or three other local bloggers on Urbanspoon. Now there are at least 20, not all locally based perhaps, but who have written about Treasure Valley eateries. 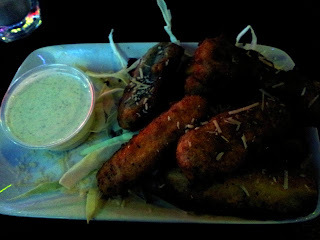 In the end, there were two things mostly responsible for my finally making my way to the Crescent Bar & Grill for a meal. 1) A reader named Kim pointed out on my Facebook page that I could sample Rocky Mountain Oysters there when I gave the price as an excuse for not making it to the Rocky Mountain Oyster feed in Eagle again this year. 2) An increasing number of vegetarians have been asking me for recommendations as time goes on, including a good friend who complains that I never drag her around on my little culinary adventures. 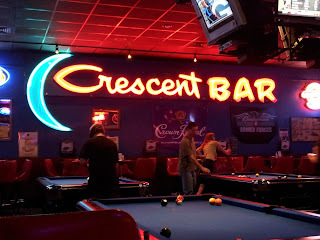 I had already been curious about checking out the Crescent for a while, and when they announced recently that they now had the area's only vegetarian fingersteaks, it seemed like a good time to go. My meat-eschewing companion and I arrived late on a Friday evening, and to be honest I just about spun on my heel and walked right back out. The place was dimly lit (I knew the pictures would turn out horrible, and I was right so I'm going to apologize for them right now. But hey, I need that little bit of evidence to back up some of the things I'm going to say! 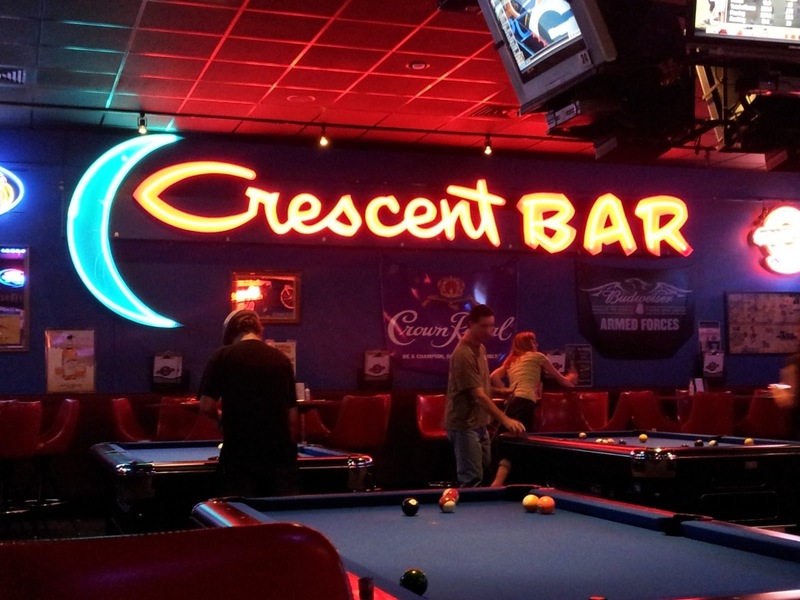 ), the walls covered in television screens and neon beer signs. A giant rack held many, many shirts, hats and other paraphernalia plastered with the bar's logo and various lawyer jokes. The whole thing felt thisclose to being a chain eatery. We seated ourselves against the merchandise wall, as far away from the neon and televisions as possible. My friend ordered some kind of mutant Copper Camel with cream to transform it from a shot into a full-fledged cocktail, and I went with Blue Moon since it's a favorite and they had it on tap. The fingersteak menu options are various, but there was nothing specifically named "vegetarian". Rather, you had the option of zucchini or portabella mushroom fingersteaks, kind of a let-down as we'd been expecting some kind of fake beef. After agonizing for several minutes, I did indeed order the "oysters", designated on the menu as Lawyer Fries. I'm still proud of myself for being able to keep from rolling my eyes as I said it. Just as a backup I also ordered a half sandwich, which I think was called a TBLT, basically a BLT with grilled turkey served on baguette. 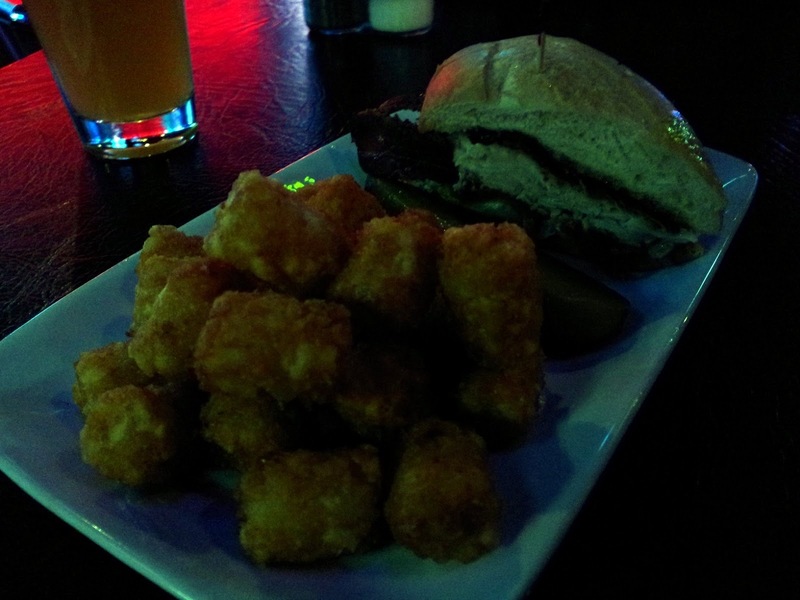 I chose tots as a side because I love them and don't see them on menus often enough. Interestingly enough, several minutes after taking our order the waitress returned to ask what kind of bread I wanted my sandwich on: white, wheat or sourdough. I replied that the menu had said it would be served on baguette and asked if they were out. "No, you can have it on baguette if you want", she said, making it sound like I had made a special request. Very interesting indeed. As I feared, my companion's fingersteaks were nothing more than fried zucchini, just left thick and cut long to resemble their namesake. The breading was thin and well-seasoned if a little oily, and they weren't too firm or mushy, so we agreed they were worthwhile (if a little overpriced) even if we didn't personally agree with the name. When my plate of balls (let's just call a spade a spade, eh?) was set in front of me, I won't deny the fact that I was vaguely horrified. 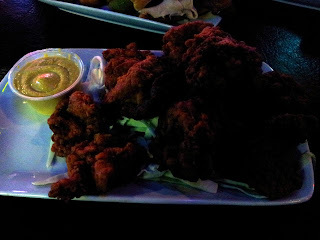 I mean these things were big and looked like mutant popcorn chicken. For a moment I was afraid that they had been left intact and simply battered and fried. As it turns out, they were in fact sliced or pounded fairly (if inconsistently) thin and just had a LOT of thick, greasy breading. The hot mustard was good and the spice helped me deal with the greasiness factor, but both it and the breading almost completely obscured what was supposed to be the main component of the dish. All I could ascertain was that they were slightly chewy/spongy, and maybe a little buttery in texture. I really noticed no distinguishable flavor. The only positive here is that the mental line has been crossed and I no longer have to fear or avoid the dish in the future, which I guess is worth ten bucks. I barely made a dent in my appetizer (frankly, it just wasn't very good and I could feel the calories quickly piling up) before turning to my main/backup/safety net course. In a series of progressively disappointing menu items, this was the absolute worst. The tater tots were the oiliest I can ever remember having. And yes, I realize that we ordered a whole lot of deep-fried food, but it doesn't have to come out dripping with oil if you know what you're doing. The sandwich itself was particularly insulting though. For $6.50 I got what was probably the equivalent of one-third of a footlong from any sub place, with little more than the heel of the bread being used. And let's talk about that bread for a second. It may resemble baguette, but it's basically a glorified hoagie roll. The crust is one of the basic things that distinguish baguette, and this was just plain soft. And this little four-inch wonder, which should have served as my antidote to all the greasy food that came before it? I forgot about the bacon, without a doubt the greasiest I have ever encountered. I would literally describe it as being damp. I finished it it though, because rising queasiness aside, I was hungry. I paid my check, unable to keep from thinking about all of the really good foods I could have gotten for less than the twenty bucks I dropped on an appetizer, half a sandwich and a beer. But the worst was yet to come. For the rest of the night, I felt like there was a pool of oil floating at the top of my stomach. It took three Tums just to get me to sleep. A big, starchy breakfast the next day helped for a little while, but by early afternoon the queasiness had returned. A few more doses of Tums and a prescription-strength anti-nausea pill helped keep it at bay, but even now some forty hours later I wouldn't say that I feel completely back to normal. In the end, I know the place is something of a local institution. They've recently added chicken and waffles (a favorite dish of mine) and I've heard really good things about their French Dip, but I think it very unlikely that I will ever return. There are just too many other, far superior options available. Happy I could put a smile on your face. I think. She is possibly the worst owner...even order Al Davis and Jerry Jones. She drove her good employees away along with her regular crowd. Good luck I'd sooner shop at the dollar store for dinner than eat there!